There’s a housing market with an under-supply of accommodation that has seen significant foreign investment in recent years. New supply has been growing but is focused on the premium market at high rents. These rents are unaffordable to the majority of potential residents, who instead have to rely on buy-to-let landlords for their accommodation. Unfortunately, after several years of strong growth and record investment, this premium market is now facing considerable uncertainty as Brexit looms. This market isn’t just found in central London but also in towns and cities across the UK. The purpose built student accommodation market could be in for a tough time when the government limits immigration. International students, particularly those from outside the EU, have become an important part of the UK university business model. 19% of students in 2015/16 were from outside the UK. That figure rises to 57% for all full-time postgraduate students and to 67% for all students at LSE. 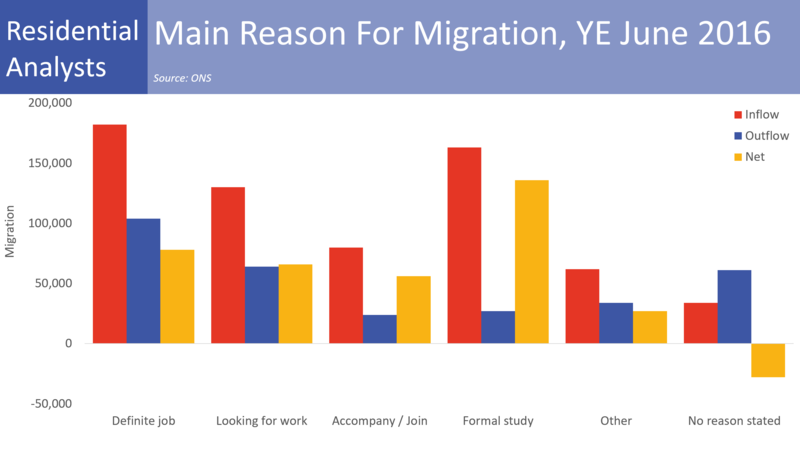 Unfortunately, a superficial reading of the ONS migration statistics suggests that students are a substantial contributor to current net migration levels. There’s some debate about whether this is accurate. For example, students leaving when their course finishes would not be recorded as leaving for formal study but instead recorded as leaving for a job or to return to their family. Therefore it is inaccurate to compare reasons for migration between inflow and outflow, as per the chart below. The ONS published a useful document last year on the issues in counting international student migrants, particularly when they leave. Ideally the UK would seek to continue attracting the best and brightest from across the world while encouraging them to stay afterwards. Regrettably, it appears the government are intent on cutting net migration and international students look set to be included in those cuts. The purpose built student accommodation market has benefited from significant investment in recent years. The construction of new schemes has also increased, helped by developers achieving higher land values than competing uses. Unfortunately, a large proportion of new development was targeted at the premium end of the market. Comprehensive data on student rents is difficult to obtain but a quick snapshot of my local market (Bath) suggests that rooms in houses cost around £100 per week to rent, university accommodation for the next academic year will cost £100-£150 per week, and a sample of three new student developments suggest rents will start at £210 per week. There will be some differences in net cost depending on whether bills are included or not but the new build schemes are clearly targeting the premium market. International students form a large proportion of demand for purpose built accommodation. 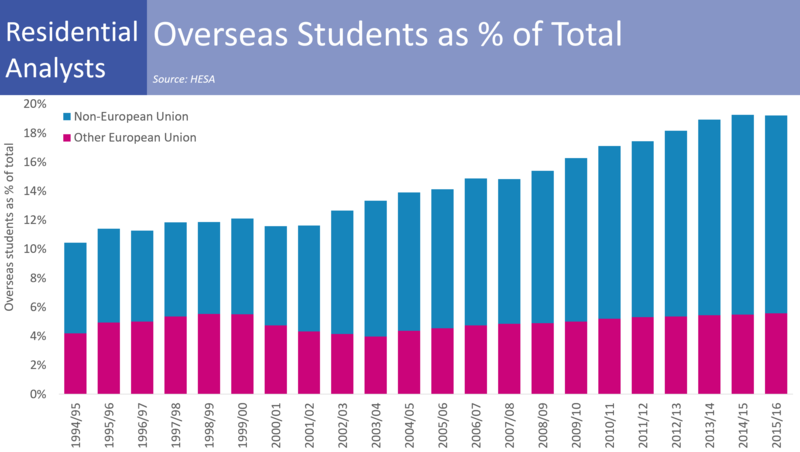 Analysis of HESA data for 2015/16 suggests that around 37% of students living in private-sector halls are from overseas. The data isn’t perfect as there can be some confusion over which category a student lives in (definitions here) but similar proportions are found in the limited data available from private sector operators. Meanwhile, anecdotal evidence suggests that newer premium purpose built accommodation has higher than average proportions of overseas students. Unfortunately, with a focus on the premium end of the market, the purpose built sector is exposed to any future cuts in international student numbers. This is particularly the case for those operators or developments that are directly let to students rather than via leases or nomination agreements with the university. However, there’s still a substantial need for more purpose built student accommodation in many markets, particularly where family homes could be released back into the owner occupier market (I first wrote about this in 2013). Therefore, in the event of significantly lower international students, there should still be demand for purpose built student accommodation in these markets. But this demand will be at lower rents than currently being achieved. If that scenario occurs, it remains to be seen whether existing owners will accept lower rental yields or if there will be a re-pricing of assets and possibly forced sales. It’s not just the purpose built student accommodation sector that is at risk in the event of lower international student numbers. University finances are at risk too. 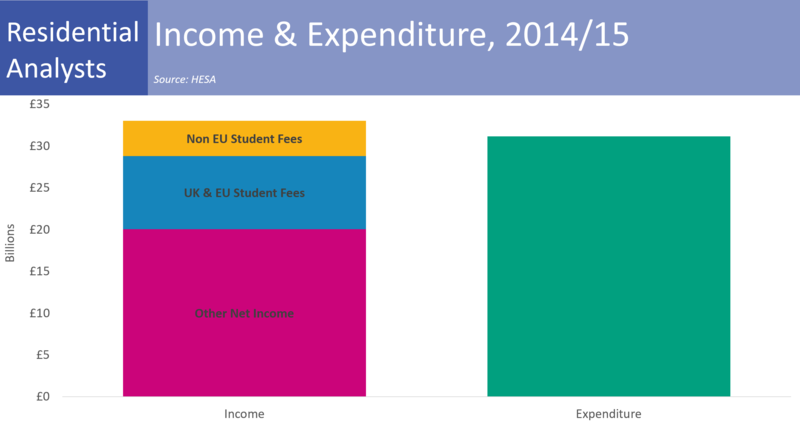 The annual surplus generated by UK universities is only equal to 44% of the fees raised from non EU students (unfortunately a split between UK and EU student fees wasn’t publicly available). Lower students numbers would in many cases also lead to lower expenditure but some universities have based substantial future capital investment on growing their international student base. University incomes falling short of forecasts could create considerable issues for the sector, reduce the quality of education for students, and harm the wider economy.